The trouble with most history books is that they are generally impersonal. They offer up the facts and then focus solely on the public figures who actually shaped events. What is omitted, save for the grainy black and white photos of yesterday, are the tales of the average people who experienced those moments; days now slowly morphing into ghostly images of a past all too soon forgotten. In choosing to read and review Georgia Lowe’s powerful retelling of the Bonus March, I purposely stepped away from this column’s focus on pulp fiction. Why? Because too many of us who love this unique brand of fiction some times need to be reminded of the times in which it was born. To better appreciate those exciting and colorful tales of escapist fancy, we should be aware that they were created during a time of national pain and suffering; the Great Depression. Sadly there have been too few novels set in this time of social upheaval, economic tragedy and hopelessness. Not that there haven’t been many competent historical text, several of which the author mentions in her own lists of references, still it takes a fiction writer to make history personal. 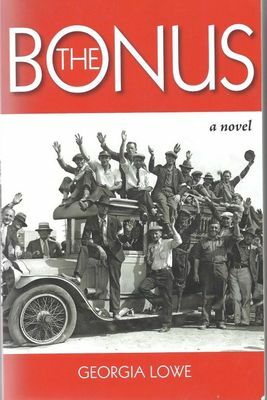 John Steinbeck did it with his “Grapes of Wrath” and now, first time novelist, Georgia Lowe achieves the same emotional impact with “The Bonus.” This is not an easy book to read for any American who loves his or her country. Its honest depiction of the Hoover administration and the cavalier, egotistical attitude of its chief participants from the President on down to his Chief of Staff, General Douglas MacArthur is deplorable, to say the least. In 1924, several years after the end of the War to End All Wars, America’s veterans were promised a bonus payment for their service. The country’s representatives spend the next five years debating on what form and amount this “bonus” will be in. Then comes the Wall Street crash of 1929 sending the economy into an unparalleled nosedive. Unemployment rises to 25%, banks collapse like dominoes, home foreclosures are rampant. On top of all this, Mother Nature delivers the second knock out punch in the form of a far reaching drought that devastates America’s central farmlands, turning abundant fields of wheat and corn into arid wastelands soon to be known as the Dust Bowl. The end result, Congress votes to defer the Bonus until 1945. Three years later, in the Spring of 1932, thousands of veterans, feeling betrayed by their own government, began to organize throughout the country. As the news of their discontent and public gatherings spread, the idea of a united march on the Capitol is born and eagerly approved. Charismatic leaders among the various groups like the VFW arise and by the start of summer, they are leading thousands of desperate veterans to Washington in every mode of travel possible from automobile caravans to train boxcars filled with weary travelers. Their one unifying goal, to force Congress into giving them their money now. We experience this historical pilgrimage through the yes of several characters including Will Hardy, a reporter for a Los Angeles tabloid, himself a veteran still enduring the effects of “shellshock,” and his lovely girlfriend, Bonnie. Bonnie, enjoying her life as a Hollywood extra is naively unaware of the country’s ailing condition until she embarks on this odyssey with her girlfriend Myrna to rendezvous with their men. By the time she arrives in Washington, she and Will become eye-witnesses to the monumental injustice perpetrated by President Hoover and his cronies. Not only does Hoover publicly ignore the peaceful petitions and demonstrations of the Bonus marchers, in the end, he has them attacked and driven out by Army troops under the command of General McArthur. “The Bonus” is one of the finest historical novels I’ve ever read and it left me emotional drained. It is clearly a cautionary tale of what happens to a people when its elected officials allow themselves to become disassociated with their constituents. It is a story of governmental betrayal at its worst and a timely warning considering our nation’s current situation. It is also a fine work of fiction with moving, believable characters that any reader will quickly recognize as each is driven to find their own piece of the American promise. We tip our pulp fedora to Georgia Lowe and we thank her deeply for reminding us all what happened that summer in 1932. It is up to each and every one of us to make sure it never happens again. Pulp writer Reese takes a stab at turning Dashiel Hammetts’ classic “The Maltese Falcon” into an occult thriller with delightful results. Instead of tough guy private eye, Sam Spade, he gives us tough gal, Violet Cambridge. She’s a widow whose husband, Walter Cambridge, was killed on a case and rather than seeing the offices of Cambridge and Knopf shut down, she assumes his position in the company. Violet has no qualms about shooting first and asking questions later. Always dressing in mourning black, she is a femme fatale who is perfectly at ease using her feminine wiles to achieve her ends; a true Black Widow in way. When her partner is cruelly murdered by an occult sect in search of an ancient artifact said to possess immeasurable power, Violet takes up the hunt for “The Damn Thing” to solve his death and bring them to justice. Along with way she soon discovers there are several other factions competing with her. There’s a religious order, dedicated to finding the cursed statue for the sole purpose of destroying it while the world famous occultist, Aleister Crowley, represents those seeking to possess it for their own twisted ends. During this danger laden hunt Violet discovers it was this very affair that led to her husband’s murder. From that point on, the case becomes a personal vendetta and nothing is going to stop this Atlanta based, strong willed investigator from uncovering the truth, no matter who she has to shoot to do so. 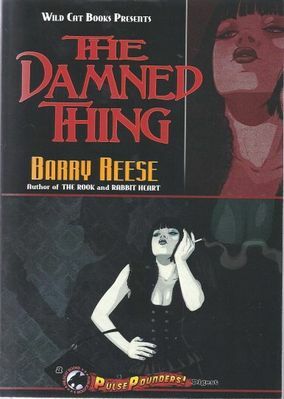 A fan of Reese’s work for several years now, this reader believes “The Damn Thing” is by far his most polished story. As a writer he continues to grow and the prose here is smooth, economic and effective. There’s no wastage of words to get the tale across with as much power and drama as it requires with not a superfluous sentence more. It’s fun, suspenseful and introduces one of the classiest dames in fiction since Honey West. Here’s hoping there’s lot more Violet Cambridge in all our futures.